When cell phones were new, they had a pretty easily definable purpose: to get in touch with someone when you absolutely could not wait to get back to a landline. But now that they're high-powered computers in our pockets, smartphone protocol has gotten a little complicated. 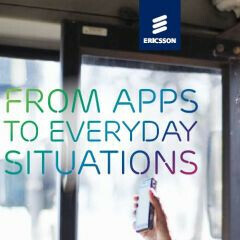 Ericcson ConsumerLab sheds some light on how we use our devices. Their survey, collected from U.S. users over an 18-month period, indicates the top 3 circumstances in which smartphone owners use their devices. Most of the data is fairly predictable, like the fact that 65% of users are on their smartphones in the early evening, and 64% of users are on their devices in the late evening. But, surprisingly, 26% of users reported that dinner-time was one of their top smartphone occasions. That means that 1 in 4 smartphone owners are burying their faces in their phones during a traditionally taboo time to do so. So has phone protocol changed that much? One explanation is that they are accessing check-in services to log their meal. Or perhaps all persons at the table are accessing their phones to plan the evening thereafter. What do you think? Should people put away their phones to make conversation for family and friends? Or did that antiquated notion die with the landline? WTF In bed??? Personally i use mine more during commuting during the long bus and train rides. Why look another human in the face ever again? Silly and nonsense. Shouldnt the %results add up to 100% ? !